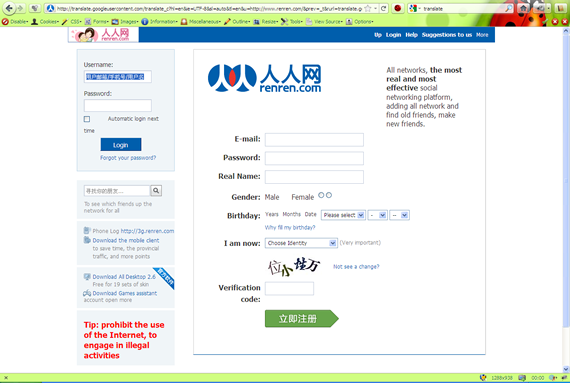 How to register at Ren Ren web site? Three days ago an announcement was made that www.renren.com will be listed at the New York Stock Exchange. As you may or may not know Ren Ren is Chinese version of Facebook so many investors are trying to hop on the bandwagon – since Facebook is the only seriuos competitor to almighty Google in the western world chances are a social networking web site in China will be even a bigger success considering China has 1.3 billion people who share one (mother) tongue. In any event some of you may be interested in joining in however as you may have noticed www.renren.com is a Chinese web site which does not have English version so registration needs to be done in Chinese. 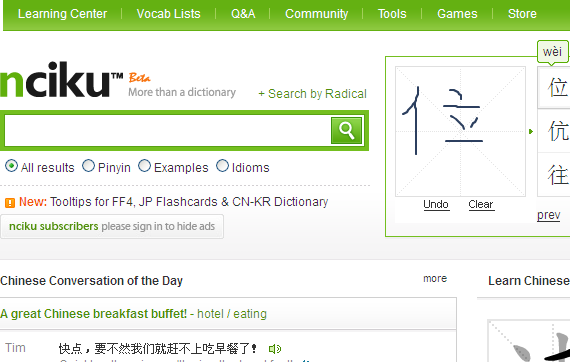 For many people writing Chinese characters is not fun. Many people even don’t have Chinese characters input system active on their computers. 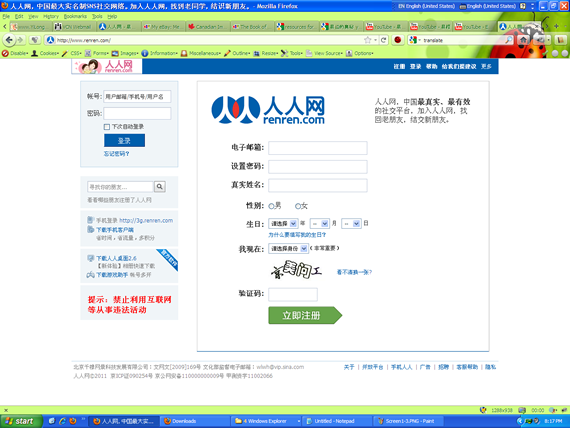 One may say: “Those people probably should not register at www.renren.com if they don’t have any of that”. 1) First go to Google Translate web page. 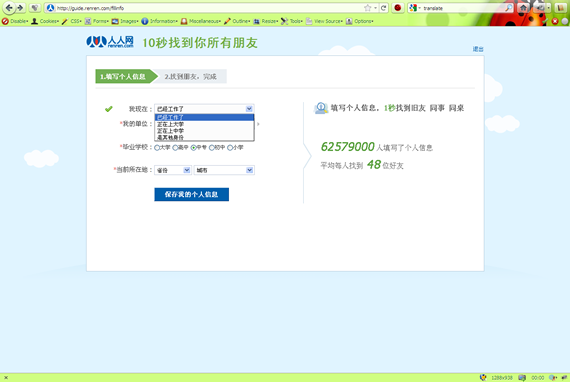 2) After that copy http://www.renren.com/ into the translation box and click on “Translate”. 3) Open NCIKU web site. Ok, now you have all you need to go quickly through the registration process. 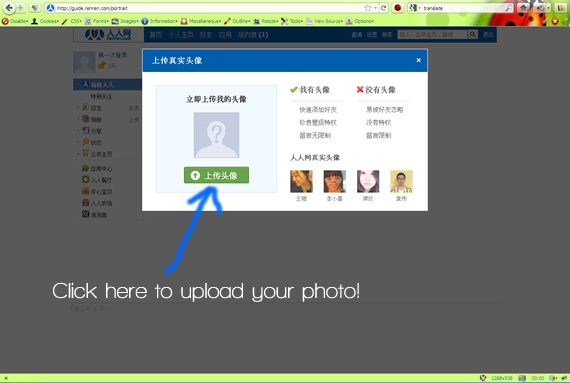 What you see above is Ren Ren main page and in the main right section is where you are supposed to enter your e-mail address. Don’t worry about it, just copy web site address from the browser (http://www.renren.com/) and paste it into the Google Translate browser window. Google translation of www.renren.com web page. Under your “Real Name” you have to write your Chinese name, since you don’t have a real Chinese name you will have to Chose one for yourself. Chinese people share relatively small number of last names, you can pick whatever you want, it doesn’t matter however if you pick one of the existing last (family) names your name will sound more realistic. 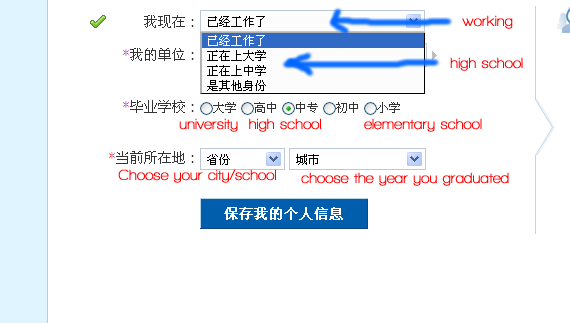 For your first name you can choose any one or two Chinese characters. Chinese people are conservative when it comes to last names but very liberal about their first names. Just copy those three characters into the “Real name” box and you will be good. As you can see everything is pretty straight forward except for the captcha… yes you are expected to enter those Chinese characters in the captcha box to continue with the registration process. 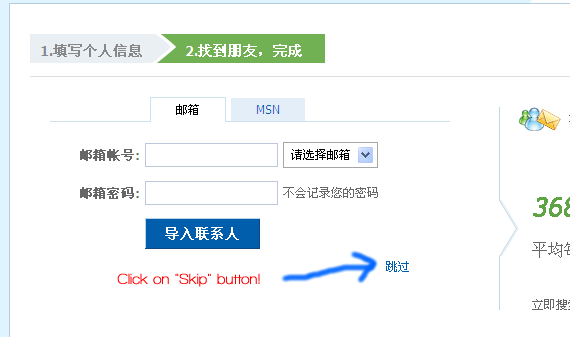 First click on Refresh button until you get a set of Chinese characters which can be easily copied (drawn) into the NCIKU web page. Then open your browser window where your NCIKU web site was loaded (in one of previous steps) and with your mouse make a drawing of those characters. As you draw each stroke NCIKU will offer a selection of several characters that look like your drawing. When you get the correct one click on it and it will be automatically copied into the box on the left side of the screen. 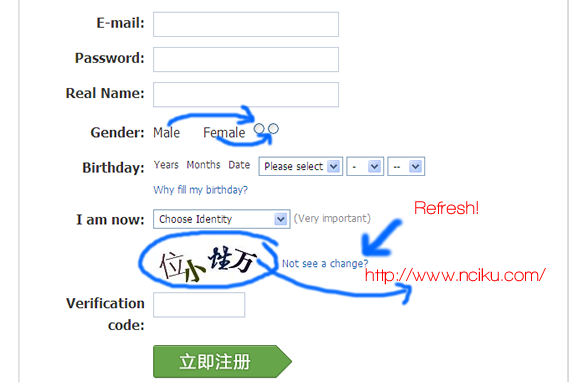 Repeat the process for all remaining Chinese characters in the Captcha. NCIKU web site - here you can draw Chinese characters. After that copy all four characters from the NCIKU page into the Renren captcha box and click on the green button at the bottom. Whew! The most complicated part is over. This will take you to the next page, first of three more pages (last two pages are extremely easy). On the third row choose your education (university, high school, elementary school) and the last row is to pick your school (left) and year when you graduated (right). For example if you entered your birthday as 1980 you graduated from highschool in 1998 or thereabouts. First on the list is Beijing, second choice is Shanghai, after that other Chinese cities. Much like Facebook Renren also wants to connect you with people in your contact list but this one can be easily bypassed, just click on the “Skip” link in the bottom right corner of the page…. And that is all there is to it! If you want to comment on this blog post please leave your comment here.